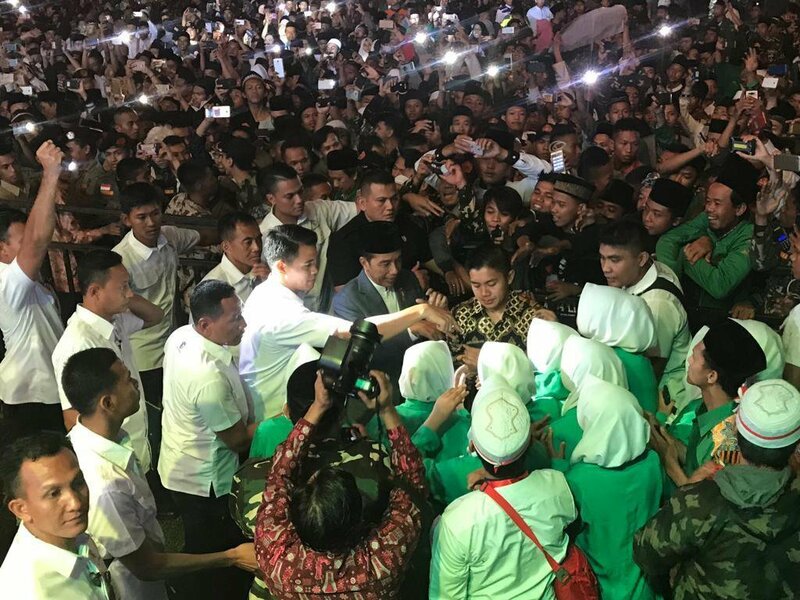 President Joko Widodo (Jokowi) and First Lady Iriana Joko Widodo attended an event commemorating the birth of the Prophet Muhammad (saw.) and National Heroes’ Day at the Great Square of Kajen, Pekalongan Regency, Central Java, on the evening of Thursday the 22nd of November. 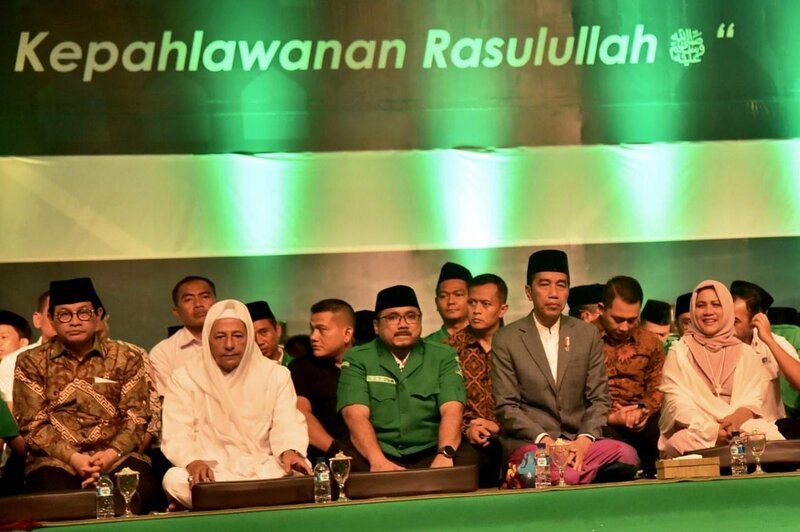 In his remarks, Indonesia’s Head of State invited all parties to reflect more deeply upon the significance of [the key Islamic teaching that] God sent the Prophet Muhammad (saw.) to be a source of universal love and compassion (rahmatan li al-‘alamin), and thus to bring humanity out of darkness towards the Light. “The Prophet Muhammad (saw.) fulfilled his mission in a way that was gentle and polite, employing methods full of love and compassion,” said the President. “As the people of the Prophet Muhammad, it is fitting that we follow his example. This includes developing noble character, fulfilling the mission of rahmatan lil alamin (“a blessing for all creation”) and safeguarding the spirit of brotherhood among all elements of society. A fellowship that does not discriminate on the basis of religion, social status or political views, thus following the Prophet’s example when leading his community in Medina,” the President continued. In addition, the President reminded the audience to be consistent in safeguarding the Unitary State of the Republic of Indonesia (NKRI). He urged the Muslim community to perform hijrah (i.e., “emigrate from,” or “leave behind”) egotistical behavior that seeks personal victory, to truly care about others. The President used this opportunity to express his pleasure to be in the midst of the Gerakan Pemuda Ansor family, because GP Ansor is always in the forefront safeguarding Pancasila; preserving the spirit of Bhinneka Tunggal Ika (“Unity Amid Diversity”); guarding the Republic of Indonesia and its 1945 Constitution; and protecting Indonesia from separatism and terrorist acts. At the end of his speech, the President advised Gerakan Pemuda Ansor to remain patient in facing every challenge. [Note: a veiled reference to recent provocations from Islamist radicals and their political allies.] 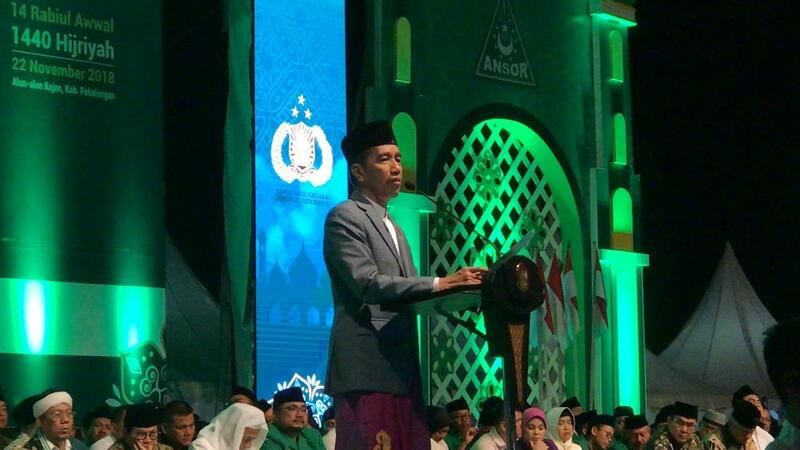 The Head of State urged GP Ansor to always place the interests of the Indonesian people and the nation above the interests of the group itself, in order to perserve the dignity of ulama (Muslim religious scholars) and the complex web of organizations affiliated with the Nahdlatul Ulama (NU); and to continuously demonstrate the magnificence of Islam, and of Indonesia, by remaining steadfast in the performance of good works and the pursuit of peace and prosperity for all, thus following the example of the prophets, martyrs, saints and heroes [who devoted their lives to the well-being of others]. “Never stray from the leadership of kyais (NU religious scholars), either in your communal life or in serving our nation. To all GP Ansor cadres: know that by following the Prophet’s noble path, our great nation shall, God willing, continue to progress. Advancing in our great work to bring social justice to all the people of Indonesia; advancing in our great work to improve the quality of Indonesia’s human resources; advancing in our great work to transform Indonesia into a nation that is baldatun thoyyibatun wa rabun ghofur (“a safe, peaceful and prosperous nation that is the dream of all people, whatever their faith or ethnicity may be”), said Indonesia’s Head of State. At this event the President and First Lady, Mrs. Iriana Widodo, were accompanied by Habib Luthfi bin Yahya; Cabinet Secretary Pramono Anung; Central Java Governor Ganjar Pranowo; Special Staff Coordinator for the President, Teten Masduki; Special Staff to the President, Abdul Ghofar Rozin; and Gerakan Pemuda Ansor General Chairman Yaqut Cholil Qoumas.